This past weekend was a success! A good time away from home with a hefty mixture of art, history, wine drinking, food eating and very good friends. I travelled with Mrs J to Canberra to visit our friend Leona and see the 'Toulouse-Lautrec - Paris & The Moulin Rouge' art exhibition at the National Gallery. More on that in a bit AND what I consider to be the unexpected HIGHLIGHT of the trip - an art installation at the Gallery that will blow your mind! First, some information about our nation's capital, Canberra, which to even the most cynical eye, should be striking. The view across Lake Burley Griffin to the high court and the Portrait Gallery. Originated from a Melbourne/Sydney rivalry so a site "half way" between was chosen. Located on the ancient lands of the Indigenous Ngunnawal people, Canberra’s name is thought to mean ‘meeting place’, derived from the Aboriginal word Kamberra. The area won selection by national ballot in 1908. Canberra was planned in 1912 by master designer, Walter Burley Griffin, a Chicago architect, who won an international design competition. The city was designed as a seat of government but also as "a scenic standpoint, with a view to securing the picturesque, and with the object of beautification". However there's one more fact, less substantiated by history, Australian's seem to hate it...or at least they like to bag it at every chance. Last week Canberra celebrated its first 100 years as a city and the national press was full of negative stories...it's boring, sterile, full of public servants, no soul, etc. etc. As a visitor I found it lovely. The city is very scenic, the weather was beautiful, sunny and warm (except for Sunday morning) and the art installations fantastic. My friend, let's call her Mrs J since she's internet shy like Mr G, and I drove down (only took 3 hours) for the weekend. Its a good drive with freeway all the way winding through a changing Aussie landscape. The blue esky (or cool chest) has the necessities of chilled champagne, wine and cheese for those in between times of catch up chats in the room and waiting for taxis ... of course! After that it was back to the room to meet Leona, our friend currently living and working in Canberra, break open the first bottle of Champagne and plan our evening. We had a good ole chat and decided we'd go to the Manuka area of town and find a restaurant for a 'not too serious' evening since Saturday was to be the BIG day. Here we are at the restaurant "Me and Mrs Jones''. The meal was good...the wine disappointing. The next day we had tickets booked for 11:00am at the National Gallery for 'Toulouse-Lautrec'. But first Leona picked us up at the early hour of 8am and took us to the Saturday Farmer's Market. FANTASTIC! The markets we get in Sydney all too often are second level buyers in it for the business of retail trade, a little cynical, and clearly not the real deal. This market had the REAL THING. Farmers clearly proud of their produce, happy to chat, friendly and heaps of stalls with home made treats. Wish I had taken my camera...we parked in a field and walked into a shed smelling of fresh meat, coffee and veggies. Loved it. Fortified with home made croissants, pastry, juice and treats to take home we went back to Leona's house for more talking, laughs and tea with her lovely bright and sunny antique tea set. On to the National Gallery. The Toulouse-Lautrec exhibit was entertaining with over 110 works. I had no idea he was such an accomplished artist with works that were as beautiful as any of the more well know impressionists. Of course the stars of the exhibit were his posters from the period of his obsession with the underbelly of Paris. It was too crowded but as we left we noticed the lines were all gone. Mrs J said, "note to self, don't attend these things early in the morning again!". Worth remembering! Amazing large art installation at the front of the National Gallery. By the time we finally left the gallery it was well after 2pm and we were starving...and dying for a glass or two of wine. Well ... and this is the downside of Canberra ... there was no where that was still serving - ANYTHING! One rather frustrated waiter who must have already turned away a dozen or so customers reminded us that in spite of Canberra being the capital its still a country town with a very small population. Tired and disappointed we found a place that would toast a panni to take away and we went back to the room to drink wine and eat our take away. One bottle of wine turned into another half at least followed by a quiet nana nap, with Leona on the couch & Mrs J and I in our rooms before dinner. Very decadent. Tired, thirsty and waiting for toasted panni. Dinner that night was at a nice little wine bar preceded by more champagne as we got ready. The food was good and the conversation even better. We closed the place as the last - happy if not a little tipsy - customers. Benchmark Wine Bar after a nice meal, several lovely bottles of red and a few glasses of white. Hi, my name is Gail. 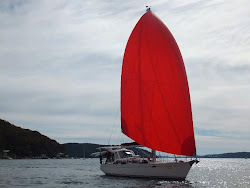 This blog is about me, my husband, our dog and our beautiful boat - Southern Belle. It's about a new life being retired entering the autum of life and what that means. Its about our adventures and challenges on the boat and my hopes + beliefs as a fit, healthy, happy and enthusiastic woman. As an "older" (age only) woman today its frustrating to know that our collective visibility has dimished..in the media, in marketing, in the public,, etc etc. Our society appears to be blind to all but the young. Well .. the saying, '60 is the new 40' certainly applies to my self awareness - actually in my head I don't feel different (not too much anyway) from how I've always felt and thought. Hence the theme of this blog 'Shine a Light'. Not only is it the title of one of my favourite Rolling Stones songs but I wanted to take a little of my invisibility and make it visible. A happy hippie type in my twenties .. I'll always be a liberal thinker, an animal lover, a tree hugger and a lover of life. So that's what I hope to communicate here. There will be some politics but mostly you'll find stuff about how life really is for a woman "of a certain age". You don't know what you've got 'till its gone!